Antibacterial activity of acetic acid against different types of bacteria causes food spoilage. Citation: Mohammed Kadhum Wali and Marwa Mohammed Abed. Antibacterial activity of acetic acid against different types of bacteria causes food spoilage. J Food Technol Pres 2018;3(1):1-4. The study was performed for study antibacterial effects of acetic acid against different types of bacteria causes food spoilage bacteria. 120 of samples were collected, including 40 raw milk, 40 cheeses and 40 yoghurt were collected randomly from Babylon province. 5 (4.1%) isolates were positive to Streptococcus spp., 10 (8.3%) of Staphylococcus aureus, 15 (12.5%) E. coli, 14 (11.6%) Pseudomonas aeruginosa and 5 (4.1%) Proteus spp. respectively. Determination of the antibiotic of isolates showed that Streptococcus spp., Staphylococcus aureus, E. coli Pseudomonas aeruginosa and Proteus spp. were sensitive to Gentimycin and Ciprofloxicin. E. coli and Pseudomonas aeruginosa showed resistance to Oxacillin and Erythromycin. The isolates of Streptococcus spp., Staphylococcus aureus and Pseudomonas aeruginosa was resistance to Amikacin. While isolating of Proteus spp. was resistance to Amoxicillin. The present study showed that effects acetic acid against isolates were resistant to different types of antibiotics at different concentrations (0.5%, 1%, 1.5%, 2% and 2.5%) respectively. The mean of three replicates of the diameter of inhibition zones (in millimeters) around each well with acetic acid solution at concentrations (0.5%) to the range from (13 mm to 18 mm). The isolates studied showed sensitivity to the range (16 mm to 18 mm) at concentrations (1%), the concentrations (1.5%) to the range (20 mm to 22 mm). However, the concentrations (2%) to the range (22 mm to 27 mm) and (27 mm to 35 mm) at concentrations (2.5%). Acetic acid, Antibiotic, Food spoilage. Microbial pathogens in food may cause spoilage and contribute to the foodborne disease incidence, and the emergence of multidrug resistant and disinfectant resistant bacteria such as Staphylococcus aureus (S. aureus), Escherichia coli (E. coli), and Pseudomonas aeruginosa (P. aeruginosa) has increased rapidly, causing the increase of morbidity and mortality . Morbidity and mortality are mainly caused by infectious diseases all over the world. The World Health Organization reported that 55 million people died worldwide in 2011, with one-third of the deaths owing to infectious diseases . Antibiotic resistant microorganisms can increase mortalityrates because they can survive and recover through their ability to acquire and transmit resistance after exposure to antibiotic drugs, which are one of the therapies to infectious diseases . Antibiotic resistant bacteria threaten the antibiotic effectiveness and limit the therapeutic options, even for common infections . Organic acids are increasingly used in food safety as preservatives  and generally recognized as safe substances (GRAS) by the FDA and are approved as food additives by European Commission, FAO/WHO and FDA . The antibacterial effect of organic acids on different types of pathogenic bacteria tartaric, citric, lactic, malic, propionic, and acetic acids . Acetic acid has been investigated as an antimicrobial agent for use in meat, including poultry, beef and pork to extend its shelf-life and decontamination of bacteria, such as Salmonella or Escherichia coli . The objects of the study, antibacterial effects of acetic acid against different types of bacteria cause food spoilage. A total of 120 samples were collected, including 40 raw milk, 40 cheeses, and 40 yoghurt was collected randomly from Babylon province. All samples kept in the icebox at 4 °C and were transported to the laboratory Vet. Public Health for analyzes. Ten milliliters of samples were taken with 90 ml of normal saline and homogenized to make an initial dilution (10-1). Serial dilutions up to 10-6 were made for each sample, then (1 ml) from each corresponding dilution (10-5 and 10-6) were inoculated into various selective media such as nutrient agar, mannitol salt, Eiosin methylene blue (EMB) blood and MacConkeys agar then incubated at 37°C for 24 hours . Isolates were identified to the species level based on the standards biochemical and microbiological methods . The stock solution of acetic acid was prepared (0.5%, 1%, 1.5% and 2%) of the acid dissolved in enough sterile distilled water to make the final volume of (10 ml) . The antimicrobial drugs used were Amoxicillin (10 μg), Gentamicin (10 μg), Erythromycin (25 mg) Ciprofloxacin (5 μg), Amikacin (30 μg) and Oxacillin (30 μg). The antimicrobial susceptibility testing was done by the agar disc diffusion method as described by the Clinical and Laboratory Standards Institute . In brief, a 0.5 Mac-Farland standardized suspension of the bacteria was prepared in 0.85% sterile normal saline solution. A sterile cotton swab was dipped into the standardized suspension of bacteria and then uniformly streaked over the entire surface of the Mueller-Hinton agar. Then, the paper discs impregnated with a fixed concentration of antibiotics were placed on the agar surface and incubated in an inverted position at 37°C for 24 hours. after incubation for 24 hours, clear zones of inhibition were produced by the bacterial growth and diffusion of the antibiotics and these were measured in millimeter using a caliper and interpreted as susceptible, intermediate and resistant . Minimum inhibitory concentration was determined using different concentrations (0.5%, 1%, 1.5%, 2% and 2.5%) of the acetic acid. Sterile cork borer of 8.0 mm diameter was used to bore well in the pre-solidified Mueller Hinton agar (MHA) plates and 100 μl volume of each dilution was added aseptically into the wells made in MHA plates in triplicate that had food- associated bacteria. 100 μl distilled water introduced into the well in place of acetic acid was used as a control. All the test plates were incubated at 37°C and were observed for the growth after 24 hrs . The zones of inhibition were measured in diameter according to Lingham T et al. . The present study showed in Table 1, 120 samples were collected, including 40 raw milk, 40 cheeses and 40 yoghurt were collected randomly from Babylon province, 5 (4.1%) isolates were positive to Streptococcus spp., 10(8.3%) of Staphylococcus aureus, 15(12.5%) E. coli, 14(11.6%) Pseudomonas aeruginosa and 5(4.1%) Proteus spp. Talukder and Ahmed  found the presence of E. coli in 36 (66.67%) of raw milk samples. (Yuen, et al., 2012) E. coli in 47% of raw milk samples in Malaysia. Pant et al. found E. coli in 100% raw milk samples in India.Leriche et al. isolated Pseudomonas spp. from 54.5% of raw milk cheeses and Morales et al. isolated Pseudomonas spp. from 50% of one day old raw milk cheeses. Singh et al. found the present 100 (17.8%) of Proteus spp. in raw milk samples. Murad et al. who reported the Streptococcus spp. 12(6.36%) from raw milk. Several studies have indicated the assortment of pathogenic bacteria, especially Staphylococcus spp. may rise in raw milk and cheese samples may responsible for nausea, vomiting, abdominal cramps and diarrhea like disease . Table 1. Prevelance contamination of milk, cheese, and yoghurt by pathogenic bacteria. Our study showed that in Figure 1 isolates of E. coli were sensitive to Amoxicillin (79%), Gentamycine (84%), Ciprofloxacin (70%) and Amikacin (90%) while resistance to Erythromycin (60%) and Oxacillin (70%). This result agrees with Sadek et al. found that E. coli isolates sensitive to Ciprofloxacin (100%), Gentamicin (100%) and resistance to Oxacillin (100%) and Erythromycin (100%). The Staphylococcus aureus isolates were sensitive to Amoxicillin (80%), Gentimycin (89%), Ciprofloxacin (83%), Oxacillin (70%) and resistance to Erythromycin (90%) and Amikacin (70%). This result similar to Mohanty et al. shows that isolates of Staphylococcus aureus sensitive to Gentimycin and Ciprofloxacin. Murad et al. reported that S. aureus resistance to Erythromycin. The Streptococcus spp. isolates were sensitive to Amoxicillin (90%), Ciprofloxacin (85%), Gentamycin (50) and Erythromycin (80%). Also Streptococcus spp. resistance to Oxacillin (60%) and Amikacin (75%) respectively. This result agrees with Mohanty et al. who found the Streptococcus spp. sensitive to Gentamycin, Ciprofloxacin and resistance to Amikacin isolates from clinical and subclinical cases of bovine mastitis. Tomazi et al. found S. spp. isolates were sensitive to Erythromycin. Author found that Streptococcus spp. resistance to Oxacillin. Pseudomonas aeruginosa isolates were sensitive to Amoxicillin (91%), Gentamycin (85%), and Ciprofloxacin (75%). Also resistance to Oxacillin (90%), Erythromycin (90%) and Amikacin (75%). Our results agree with author, found that Pseudomonas aeruginosa were sensitive to Ciprofloxacin and resistance to Amikacin from pregnant genital tract and delivery room in Erbil Hospital. Swetha et al. have reported 100% resistance to Oxacillin by the isolate of P. aeruginosa. Author found that Pseudomonas spp. had the highest sensitivity to Gentamycin. In addition, Proteus spp. strains were sensitive to Gentamicin (68%), Oxacillin (83%) Ciprofloxacin (65%), Amikacin (80%) and Erythromycin (60%), while resistance to Amoxicillin (70%). This result agrees with Abdullah and Al-shwaikh  reported that Proteus spp. Isolates were sensitive to Amikacin, and Ciprofloxacin. However, isolates sensitive to Erythromycin and Gentimycin [24,25]. Proteus spp. isolates resistance to Amoxicillin. The antimicrobial activity of acetic acid was investigated against bacterial that resistance to different types of antibiotics (Streptococcus spp., Staphylococcus aureus, E. coli, Pseudomonas aeruginosa and Proteus spp.) using the well diffusion method in at different concentration (0.5%, 1%, 1.5%, 2% and 2.5%). The mean of three replicates of the diameter of inhibition zones (in millimeters) around each well with an acetic acid solution is represented in Table 2. It was found that at all concentrations. Acetic acid was able to inhibit bacterial growth at concentrations (0.5%) to the range from (13 mm to 18 mm). The isolates studied showed sensitivity to the range (16 mm to 18 mm) at concentrations (1%), the concentrations (1.5%) to the range (20 mm to 22 mm). However, the concentrations (2%) to the range (22 mm to 27 mm) and (27 mm to 35 mm) at concentrations (2.5%). These results were agrees with Abdullah and Al-shwaikh  who reported that the minimum inhibition zone of acetic acid at concentrations (1%) range between (10 mm to 15 mm), the concentration at (2%) the inhibition zone from 14 mm to 20 mm) respectively against Pseudomonas aeruginosa, Staphylococcus aureus and Proteus spp. Also  the inhibition growth of acetic acid ranged between 0.5 and 1.0% (v/v) against (Staphylococcus aureus isolates I, III, E. coli II) was found to be the most sensitive. According to Carpenter et al. acetic acid displays residual activity to prevent the growth of pathogens. Acetic acid at the level of 0.1-0.5% in commercial significantly reduced numbers of S. aureus by 1.2-2.3 log10 CFU/ml at 10°C [26-28]. Raftari et al. reported that effects of organic acid against Staphylococcus aureus more pronounced than E. coli at concentrations 1%, 1.5% and 2%. Also found bacterial growth of Clostridium spp. decreased more than E. coli in same treatment. The gram positive bacteria high sensitive to different types of antibacterial than gram negative bacteria because possess an outer membrane. The bacterial growth (Streptococcus agalactiae) affected by acetic acid at high concentration. Also, this bacteria sensitive to weak acids, certain lactobacilli and bacteria are can to increasing growth in low PH [30,31]. Table 2. Minimum inhibitory concentration (MIC) of acetic acid against food bacteria. This study indicates that the acetic acid antimicrobial agent can reduce the pathogenic bacteria and increase the shelf life of food products. I would like to thank all the faculties who participated in the study. Miladi H, Zmantar T, Chaabouni Y, et al. Antibacterial and efflux pump inhibitors of thymol and carvacrol against food-borne pathogens. Microbe. Pathogen. 2016;99:95-100. Nabavi SM, Marchese A, Izadi M, et al. Plants belonging to the genus Thymus as antibacterial agents: From farm to pharmacy. Food Chem. 2015:173;339-47. Marchese A, Barbieri R, Sanches-Silva A, et al. Antifungal and antibacterial activities of Ellicin: A review. Trends Food Sci Technol. 2016;52:49-56. Paphitou NI. Antimicrobial resistance: Action to combat the rising microbial challenges. Int J Antimicrob Agent. 2013;42:25-8. Lingham T, Besong S, Ozbay G, et al. Antimicrobial Activity of Vinegar on Bacterial Species Isolated from Retail and Local Channel Catfish (Ictalurus punctatus). J Food Process Technol. 2012;11:1. Surekha M, Robinson RK, Batt CA, et al. Preservatives. Classification and properties. In Encyclopedia of Food Microbiology. Academic Press, New York, USA. 2000:1710-7. Sakhare PZ, Sachindra NM, Yashoda KP, et al. Efficacy of intermittent decontamination treatments during processing in reducing the microbial load on the broiler chicken carcass. Food Control. 1999;10:189-94. Khalil I, Anwar N. Isolation, Identification and Characterization of Lactic Acid Bacteria from Milk and Yoghurts. RR J Food Dairy Technol. 2016;3:4. McFadden JF. Biochemical tests for identification of medical bacteria 3 RD. edition, Lippincott Williams and Williams, USA, 2000. Pundir RK, Jain PP. Evaluation of five chemical food preservatives for their antibacterial activity against bacterial isolates from bakery products and mango pickles. J Chem Pharm Res. 2011;3:24-31. CLSI. Performance standards for antimicrobial susceptibility testing; twenty-third informational supplement (M100-S23). Clinical and Laboratory Standards Institute, USA. 2016. Talukder M, Ahmed HM. Determination of antibiotics sensitivity profiles of bacteria isolated from raw milk. Asian J Med Biol Res. 2016;2:396-401. Pant R, Nirwal S, Rai N. Prevalence of antibiotic resistant bacteria and analysis of microbial quality of raw milk samples collected from different regions of Dehradun. Int J Pharm Tech Res. 2013;5:804-10. Leriche F, Bordessoules A, Fayolle K, et al. (2004). Alteration of raw-milk cheese by Pseudomonas spp. : monitoring the sources of contamination using fluorescence spectroscopy and metabolic profiling. J Microbiol Methods. 59: 33-41. Morales P, Fernandez-Garcia E, Nunez M. Volatile compounds produced in cheese by Pseudomonas strains of dairy origin belonging to six different species. J Agric Food Chem. 2005;53:6835-43. Singh V, Kaushal S, Tyagi A, et al. Screening of bacteria responsible for the spoilage of milk. J Chem Pharm Res. 2011;3:348-50. Murad KS, EL Kamali, Ibrahim AM. Isolation, identification and antibiotic treatment of some bacterial strains caused bovine mastitis in libya. Eur J Basic App Sci. 2016;3:3. Marjan S, Das KK, Munshi SK, et al. Drug-resistant bacterial pathogens in milk and some milk products. Nutr Food Sci. 2014;44:241-8. Sadek OA, Sayed SM, Berbawy SM, et al. Some antibiotic resistant bacteria of public health hazard isolated from raw milk sold in some Assiut City markets. Assiut University Bulletin for Environmental Researches, Egypt. 2014;17. Mohanty NN, Das P, Pany SS, et al. Isolation and antibiogram of Staphylococcus, Streptococcus and E. coli isolates from clinical and subclinical cases of bovine mastitis. Veterinary World. 2013;6:739-43. Tomazi T, Filho S, Heinemann B, et al. Molecular characterization and antimicrobial susceptibility pattern of Streptococcus agalactiae isolated from clinical mastitis in dairy cattle. Plos One. 2018;13. Swetha CS, Jagadeesh A, Rao KV, et al. 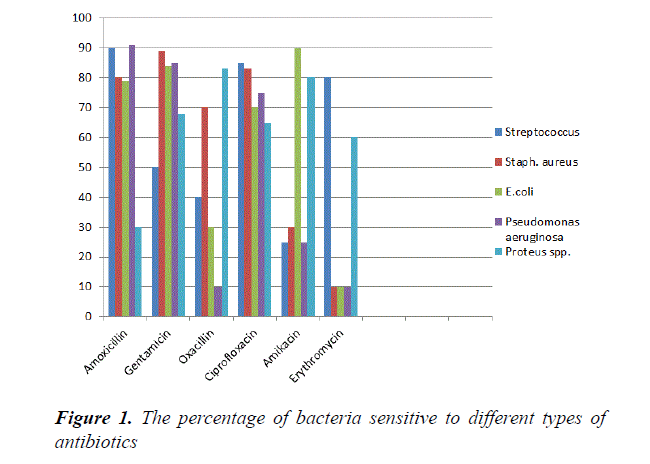 A study on the antimicrobial resistantce patterns of Pseudomonas Aeruginosa isolated from raw milk samples in and around Tirupati, Andhra Pradesh. Asian J Dairy Food Res. 2017;36:100-5. Abdullah R, Al-shwaikh MA. Studying the Effect of Acetic Acid against Different Types of Bacteria Causing Chronic Otitis Media. Journal of the College of Al-Ma'moun University. 2009;14. El Zubeir EM, El Owni OAO. Antimicrobial Resistance of Bacteria Associated with Raw Milk Contaminated by Chemical Preservatives. W J Dairy Food Sci. 2009;4:65-9. Carpenter CE, Smith JV, Broadbent JR. Efficacy of washing meat surfaces with 2% levulinic, acetic, or lactic acid for pathogen decontamination and residual growth inhibition. Meat Sci. 2011;58:256-60. Olaimat NA, Al-Nabulsi AA, Osaili MT, et al. Survival and inhibition of Staphylococcus aureus in commercial and hydrated tahini using acetic and citric acids. Food Control. 2017;77:179-86. Fouad HK, Salh QK, Shakir AY. Isolation of Potential Pathogenic Bacteria from Pregnant Genital Tract and Delivery Room in Erbil Hospital. Diyala J Medicine. 2014;7:1. Perim CM, Borges CJ, Celeste C, et al. Aerobic bacterial Profile and antibiotic resistance in patients with diabetic foot infections. Revista da Sociedade Brasileira de Medicina Trop. 2015;48:546-54. Raftari M, Jalilian FA, Abdulamir AS, et al. Effect of Organic Acids on Escherichia coli O157:H7 and Staphylococcus aureus Contaminated Meat. Open Microbiol J. 2009;3:121-7. Ewadh M, Hasan H, Bnyan I, et al. Antibacterial Activity of 2-(2-Hydroxy phenylimino) Acetic Acid. Ad Life Sci Technol 2013:7. Yuen K, Yee CF, Yin FH. Microbiological quality and the impact of hygienic practices on the raw milk obtained from the small-scale dairy farmers in Sabah, Malaysia. Int J Agric Food Sci. 2012;2:55-9.